To a degree insufficiently captured by the term governance, the present age is one of institutional complexity. China is a case in point. An amalgam of socialist, capitalist, corporatist, and pluralist characteristics, China's systems of governance defy classification using extant categories in the institutionalist literature. What, after all, is a socialist market system? A Phenomenology of Institutions begins with the problem of describing emergent institutional phenomena using conventional typologies. 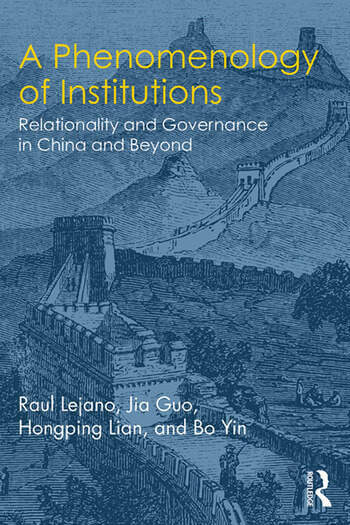 Constructing a new descriptive framework for rendering new, hybrid, and flexible institutional designs, Raul Lejano, Jia Guo, Hongping Lian, and Bo Yin propose new descriptors, involving concepts of autopoeisis, textuality, and relationality, that might better describe new and emergent models of governance. The authors illustrate the utility of this framework with a number of case studies, each dealing with a different aspect of Chinese legal and civic institutions and comparing these with 'Western' models. This book will be a valuable resource for institutional scholars in the fields of public policy, political science, organization studies, public administration, and international development, studying new and emergent forms of governance. Raul Lejano is a professor in the Steinhardt School at New York University (NYU). He is the author of Frameworks for Policy Analysis (Routledge), translated to Chinese as ??????—??????? (Tsinghua Press) and co-author of The Power of Narrative in Environmental Networks (MIT Press). He also taught at the Massachusetts Institute of Technology, University of California, Irvine, and the University of Hong Kong. Jia Guo is an associate professor in the School of Government at the Beijing Normal University. Her main research interests are Public Policy (Environmental Policy), Non-profit Organization, and Comparative Public Administration. She obtained her PhD from the University of Hong Kong. Her work on environmental NGOs in China demonstrates how a nuanced form of civil society actor is emerging, combining aspects of traditional nongovernmental institutions and more corporatist forms of civic engagement. Hongping Lian is an associate professor at the School of Government in Beijing Normal University, the Vice Dean of the Academy of Government in Beijing Normal University, China. She obtained her PhD in sociology from the University of Aberdeen, UK, and did postdoctoral research on housing studies at the Department of Public Policy in City University of Hong Kong with Ray Forrest. Her primary areas of scholarship are land policy and housing policy. Bo Yin is an associate professor in the College for Criminal Law Science at Beijing Normal University. He received his PhD in law from University of Aberdeen in Great Britain. His primary areas are criminal justice, criminal procedure and legal theory. He has published a monograph titled Criminal Procedural Consequences Stemming from Criminal Procedural Deficiencies as well as about 20 articles in English and Chinese.